The Secret Recipe Club has a special reveal day today! We are centered around BBQs and Picnics and I had the most delightful blog to sneak around called Well Dined. Sarah is the blogger there and she and her husband, like us, are foodies who like to cook at home. I think we could be great friends. Once, on a school dare, I dyed my hair pink and purple and turned out that I loved it! There were a number of great recipes on Sarah's blog that suited for a picnic, like this Quinoa Strawberry Watermelon Salad, and I could really see me working with this recipe for Peeps Cookies to make a picnic version. Ultimately though, I chose this recipe to feature from the blog. Divide the pork between the tortillas, top with the vegetable mixture and any other desired toppings. Here's my take on it using it for a picnic. Warm up the pulled pork and place it in a thermos. Heat BBQ sauce and add to thermos. Shake. Warm up tortillas and wrap in foil, with a piece of waxed paper in between. Put cheese, sour cream, salsa and sauteed vegetables in separate containers. Pour peach iced tea into a large thermos with ice. Pack up a dessert of choice. Pack up needed utensils and glassware. Load up picnic basket and head to a park! Unpack the basket and pass around the various supplies. Assemble tacos. Pour tea. Keep dessert covered. Eat and enjoy and don't forget the dessert! Such easy, fun and enjoyable picnic when using leftovers as the base. No stress, just an enjoyable day out in the sun! 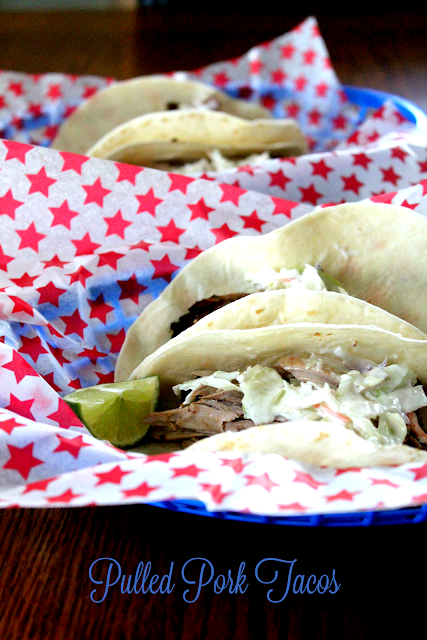 I just love Pulled Pork and all the great ways to use it...like these wonderful tacos!! Yum! Pulled pork is fabulous in so many ways! YUM! Let me know the next time you make these and I will be right over ;) They sound seriously awesome. We have pulled pork tacos all the time. Perfect use for the extra pulled pork. Visiting from SRC. Happy Memorial Day. Those look so delicious. I have never had a pulled pork taco! Here's my cheat: I go to my favorite BBQ place, get a pound of their pulled pork (naked) and that's the meat I use. Yum. Oh tacos....there is nothing better! I'm definitely going to have to try my hand at pulled pork. I love tacos, but I get sick of beef sometimes. This is a great alternative. Thanks for sharing. Pulled pork is so delicious and soft. 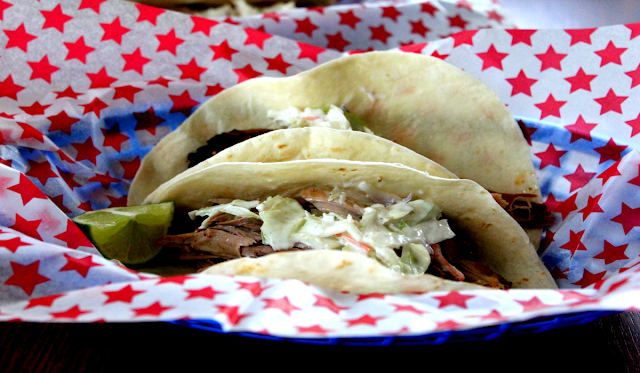 It's the perfect meat to include in tacos and it maintains such great flavor in any recipe. I know someone who would love these. You say pulled pork and he's there. You say tacos and he's there. You say both and you can't pull him away! Oh my word. How did I forget the sour cream??? Oh my goodness these look delicious. I love pulled pork! I love a good taco! My friend loves pulled pork, in fact is obsessed so this would be a great dish to cook for him! Oh my gosh, this looks delicious! I haven't tried pork tacos before - I always seem to go the veggie/beans route. I need to try this! I love this idea!! and who doesn't love TACOS!? YUM! What a great way to use pulled pork! They look so good and refreshing! Yum! These tacos sound delicious! I love your stars wrapper. So delicious! My boyfriend is a huge pulled pork fan so I know he would love this recipe! Awesome picnic recipe! We had barbecue pulled pork on Memorial Day with baked potatoes. It was so good! Hahha I literally just made taco's last night! As a vegan I wouldn't use pork, but there are a few vegan meat alternatives that are similar to pulled pork. I also have some jackfruit in the pantry, that supposed to gives a similar texture!!! I might just be inspired to try out tacos with the jackfruit! thanks! What a great tip to put the meat in a thermos. Never would have thought of that. Even though I don't eat meat, I know that my family would enjoy this recipe. Thank you for sharing! I love the idea of keeping the pulled pork in a thermos for transporting it to a picnic. That should keep it nice and warm for tacos! Not a huge pork fan, but I could easily adapt this to a pulled chicken recipe. And let's not get started on tacos... love, love, and love. Great meal for these summer months, and you display them so nicely!